National Believe Day is Friday: Join Macy’s in its 5th annual partnership with Make-A-Wish®! They’ll donate $1/letter received now through Dec. 24, up to $1M— plus an additional $1/letter this Friday, for up to another $1M! Post a picture with #MacysBelieve and you could be in a Macy’s commercial — plus check out the TV special “Yes, Virginia” on CBS at 8:30 p.m.
USF Share the Love: My alma mater’s Alumni Association is sponsoring this two-week contest with daily giveaways. 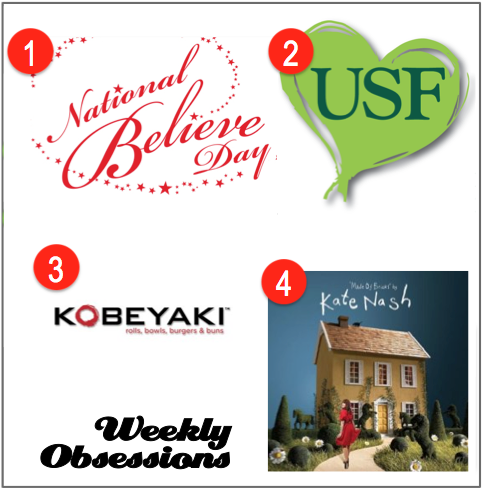 Entering is super easy, and you can win tons of cute USF-themed items! Kobeyaki: The struggle is real to find a quick lunchtime spot that also satisfies. Lucky for me, the midtown location of this fast Japanese food place opened recently. Like their page on Facebook for a chance to win free Kobeyaki for a year! “Merry Happy” – Kate Nash: Pandora wins, once again. A breakup ballad that’s anything but sad, coupled with the Brits’ sense of humor. What’s not to love?